The Archbishop of Canterbury has accused the government of treating religious faith as an "eccentricity" practised by "oddities". The government, however, said that it recognised the important role faith plays in shaping the values of millions of irrational people throughout the land. Dr Rowan Williams believes that it would do no harm for political leaders to be more open about their faiths, and indeed points out that the leaders of the three main parties all have a very strong moral sense of some spiritual flavour. 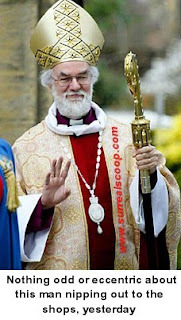 Leading Mumbo-Jumbo commentator, John-Paul Billingsworth, said that in Britain it has never been part of the political landscape to be open about your religious faith, should you discover that you are so afflicted. The Roman Catholic Church says that selective quotation from the canon of guilt, shame and objectifying women is what is needed to make religion appealing to people with any semblance of rationality.